Notorious for its monstrous line that whirls itself down Goulburn Street and at times, past Dixon street. The sight in itself should be enough to put anyone off Mamak. But the promise of their cheap and cheerful eats is now legendary. It just keeps everyone coming in single file. I’d like to hit rewind for a moment to when I stumbled across afoodstory. I still remember it to this day. 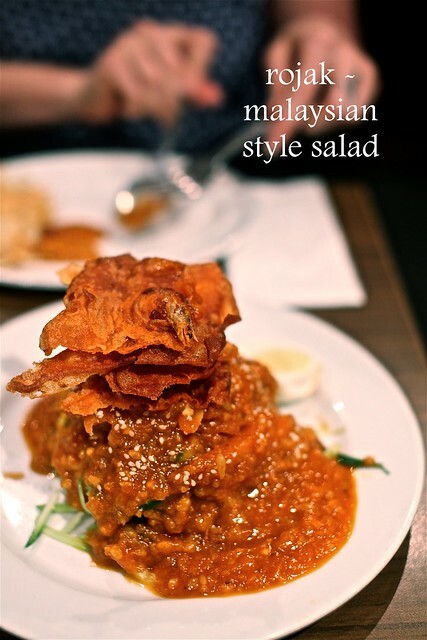 I found their Mamak post on their blog and it left me dying to go. I loved their blog and read it with fond admiration. One of the many blogs that inspired me to start up my very own. When I met them at a bloggers dinner I was pretty thrilled! I had to confess that in spite of reading their Mamak post, I still hadn’t made it there. So we made a pinky swear that we would go together! Hit fast forward and here I am sitting with Lex and Dylan and it seems quite surreal, to be sitting here with ‘the’ exact same bloggers that I had read about in that post! Lex is an expert Mamak goer and you can tell. She knows exactly what to order and every single word off the menu rolls off her tongue. First up, the roti canai. It promises to be fluffy on the inside and crunchy on the outside and it doesn’t disappoint. 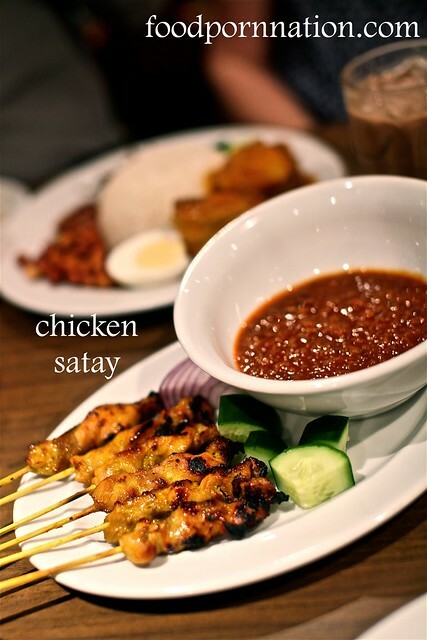 The satay sticks is a quintessential must have item. The chicken skewers are juicy, tender and packed with flavour from the marinade and charcoal. The peanut sauce is the right amount of sweet and spicy, I mean… there are just no words. It was so good, I literally ‘ate’ the sauce, with the bowl in one hand and the spoon in the other. Lex, Dyl and Brazil weren’t far behind either. The only draw back was that we felt short-changed when the chicken sticks arrived. According to Lex and Dyl, they have definitely downsized on their servings since their last visit. Slightly disappointed, we move on and we order another batch. After a recent visit to Malaysia and Borneo, I ate this gem morning, noon and night. It is arguably Malaysia’s national breakfast dish but you can find it any time of the day due to its popularity. 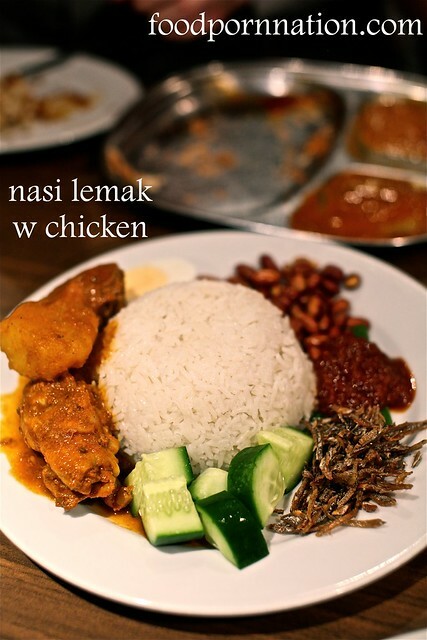 I wanted to have the Nasi Lemak with chicken so I could rate the authenticity of flavours and likeness to the dish back in Malaysia and it was absolutely spot on. The tea tarik is a wonderful recreation of the popular Malaysian drink. With its signature frothy top, this baby is as authentic as its gets. It is so damn comforting, you can’t but help sigh at every sip. 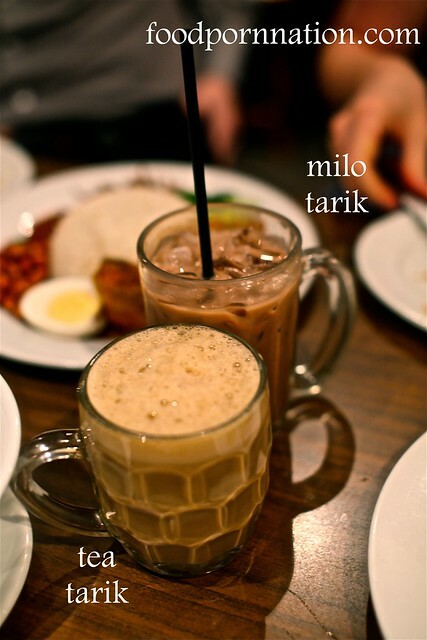 The milo tea is another typical Malaysian tea and is accurately represented here. The tea is also tasty but I only have eyes for the tea tarik. 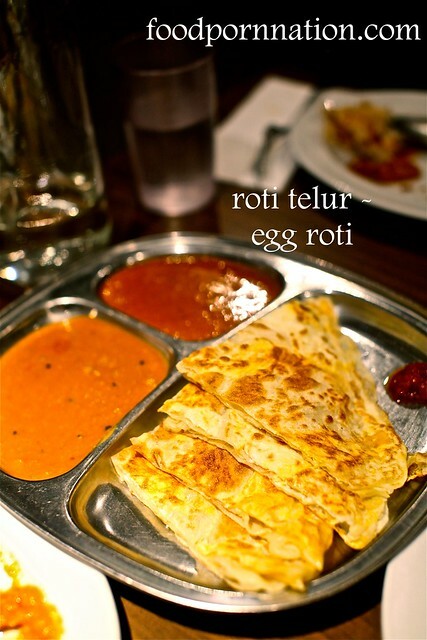 Roti telur is just as tasty but it doesn’t have the same textural contrasts as the roti canai. 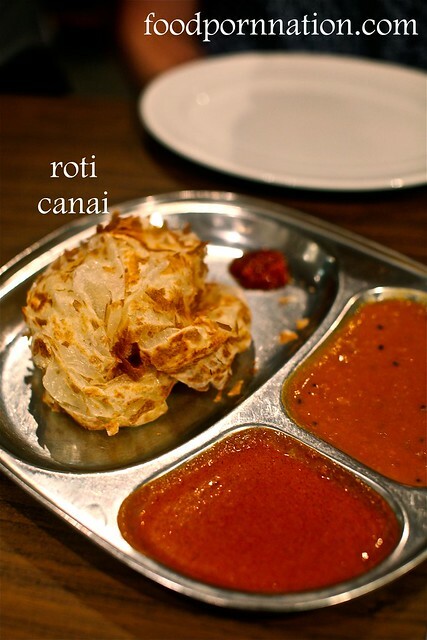 The roti encased a fluffy egg filling and it is served with two curry sauces and a spicy sambal sauce. The curry sauces are pleasant enough but all my love heads straight for that little blob of spicy sambal sauce. Rojak plays a bit of visual trickery on you. You don’t even know what it is when it comes out. But it is a salad alright. Unfortunately, it doesn’t really tickle anyone’s fancy. I found it overly drenched in the spicy peanut sauce, that it overwhelmed the other elements of the dish. 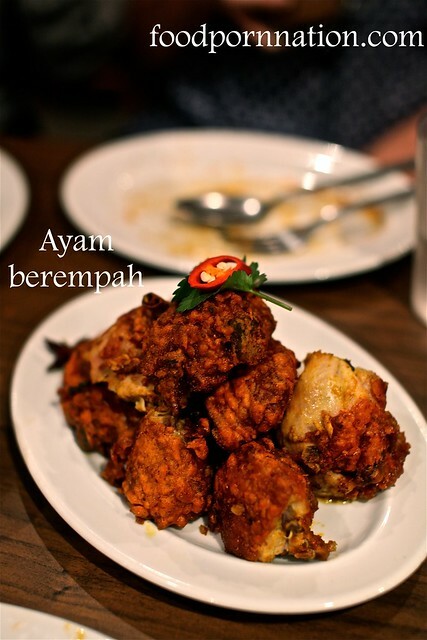 Ayam berempah is like Malaysian KFC with the added flavours of star anise, cardamom, cinnamon and cloves infused into the skin. The chicken skin was nice and crispy with the resounding crunch to every bite. But KFC will always be my first true love. No contest. 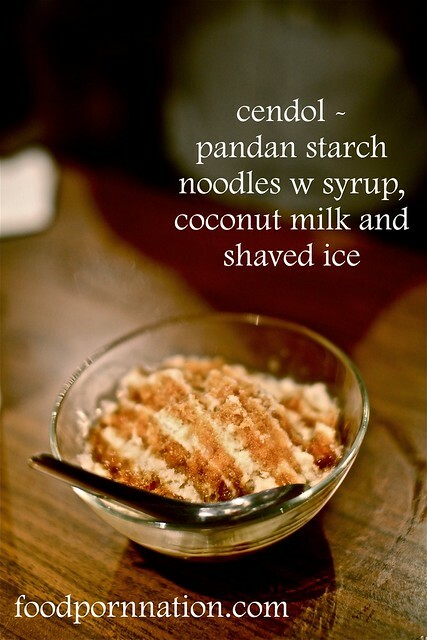 This is a very typical asian dessert with the jelly like morsels swimming in a soupy syrup/milk with shaved ice on top. I wholeheartedly enjoyed this dessert but I think you may need an asian palate to truly appreciate this. Brazil had his heart firmly set on the sweet roti. 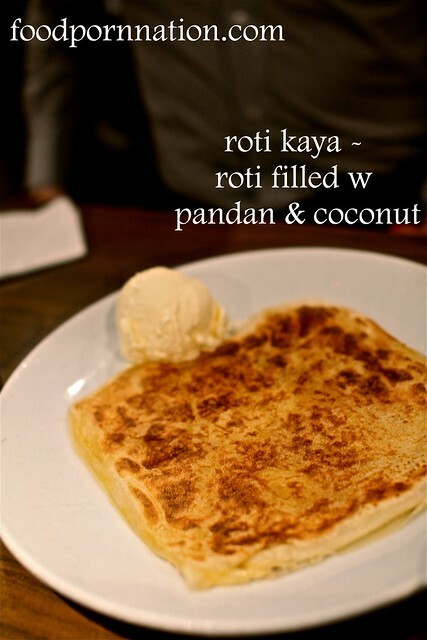 The sweet buttery roti was filled with a pandan and coconut spread, showcasing the roti’s versatility. Again, the roti did not disappoint and this was hands down the crowd favourite. Welcome to Mamak, for some cheap, cheerful and authentic Malaysian that’s worth the line and the wait. I actually can’t remember the last time I visited Mamak but something tells me it was more than three years ago. I’m not one for queues so that’s probably why. Food looks good! I hate queues with a passion but I was lucky that Lex and Dyl were already in the queue and even then, they only waited 10 min. The trick might be to just go early and go there during the week! It’s a bit of a buzz isn’t it? And there are still so many more bloggers that I am dying to meet! I adore mamak. BYO, endless roti, ridiculously cheap bill – what’s not to love?! 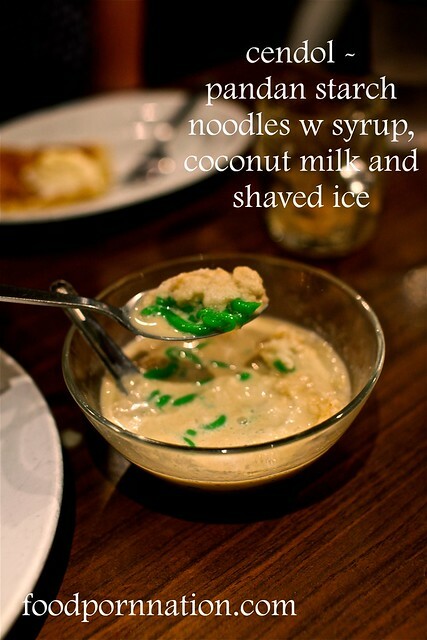 winter comfort food here we come… the fish curry is one of my favourites.